We have become so used to canned, frozen, and convenience mix biscuits, that making them from scratch may seem time consuming and difficult. You can easily make your own biscuits from scratch. This is a guide about making biscuits from scratch. I make a lot of bread. Mostly biscuits and 'hoe cakes'. A bit of trivia, here. Hoe cakes can be made of flour or corn meal. The name derived from the early American practice of putting a small amount of dough on a very clean hoe blade and placing the blade atop hot coals or stones in the fireplace. You could put the dough in a covered frying pan and place the pan in the glowing embers. Then, it would be called an 'Ash cake'. More trivia. Real Southern biscuits are made with hog lard (I use equal amounts of lard and vegetable shortening) and buttermilk. True Southern biscuits will never see a rolling pin. Rolling makes them tough. Nor will they see a biscuit cutter. A ball of soft, almost wet, dough is very gently shaped in the hands, working the dough as little as possible. A bit of flour may be dusted on the dough as needed to prevent it from sticking to your hands. 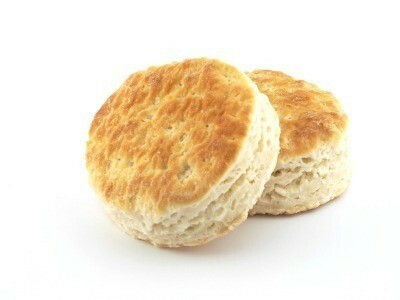 A truly good biscuit is not thick or high. Just thick enough to open with a fork for filling with homemade blackberry jelly. More crust and less 'innards' is the key. To get that 'just right' crust, I brush a generous amount of shortening over the biscuit tops when they just begin to brown and return them to the oven to finish baking. Later, I would wash and wash and wash that brush, trying to get all the shortening from it before putting it away. I never felt it was really clean. I solved that problem. I stopped washing the brush. 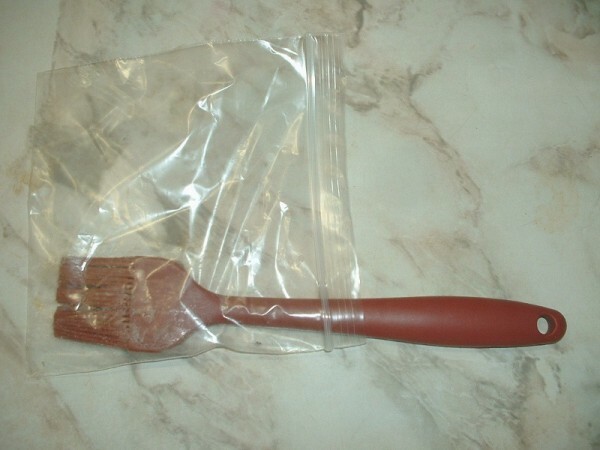 My tip: Just store the brush in a baggie, sealing the top as much as possible. (I do give it an occasional cleaning). Bo Jangles, eat your heart out! It took me about 50 years to discover the "secret" to nice flaky biscuits. When the recipe tells you to cut the butter into the flour, I have "my way" which makes the recipe almost a never fail. Instead of just measuring the flour and adding the required butter, freeze a stick of butter ahead of time. Then using a food grater, grate the frozen butter into the bowl of flour. Lightly stir it into the flour with a fork while it is still very cold, then continue with your recipe The difference is amazing. And by the way, this also works for crumb toppings for desserts and pies. I keep a small container of flour, butter and little salt mixed this way in the fridge to make a quick white sauce. Source: My inspiration was my DH who would never eat my biscuits until I discovered this little trick. If you want your biscuits to be crusty, then you have to spread them several inches apart on the baking sheet. If you let them touch then, they'll be soft. When splitting hot biscuits (or hot rolls) to add butter, instead of cutting with a knife, push the tines of your fork into the biscuit (or roll) around the middle, then pull apart. Don't buy the expensive biscuits in the tube from the cooler at the grocery store. Make your own from scratch! Saves money and tastes much better too. My biscuits have cracks on top of them. What am I doing wrong? I use White Lily flour, crisco shortening and buttermilk. I always put butter, or oil on top of my biscuits. They brown very well on top. Be sure you pre heat the oven first. Hi, I used to manage a biscuit breakfast place. 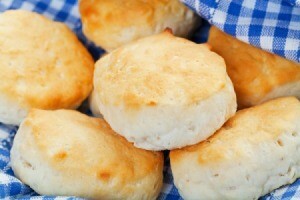 An old lady who worked there was from Tennessee, said to rub the tops of the biscuits with butter. We used melted butter with a brush. If you do it right when they come out of the oven it makes them soft on the top. blend this with a pastry blender or two knives. pour in enough buttermilk in to the mixture holds its shape to form a loose ball. It will be a soft dough. Tear off a piece of wax paper large enough to spread dough. Dust generously with flour. place dough on floured wax paper, dust dough liberaly with flour. Cut out biscuits with a round cutter(I use a small can that I've cut the bottom out of. I learned this from my Greatgrand mother when I was a little girl. She was a great cook,) Place your biscuits on a dark baking pan that has been sprayed with cooking spray. I use buttered flavored. Spray a bit of butter spray on top too. I bake my biscuits in a hot over and watch them closely. 450* oven until the bottoms are good and golden brown. I then turn on my broiler and brown the tops. This makes them crunchy on bottom and soft in the centers. I have a friend who every so often I go to her house and make a huge batch, she freezes them and bags them up and she has her "Susie" biscuits any time she wants them. What are friends for? You're putting too much shortening in the biscuits, and/or you're letting them rise too much while making them. Probably too much shortening. Cut back, and also, a little tip we found out, keep your flour in the freezer, so it will be cold while making the biscuits, then they don't rise so much ahead of time. We buy flour in bulk when we found this out. And kept it in the freezer. always pour a little oil in the bottom of a pan and coat both sides of the biscuit as she laid it in the pan. They were always PERFECT! I agree, brushing them with butter is a must. Also, I think you need to be sure the dough isn't too dry or overworked. Bake quickly in a hot oven. I have everything to make homemade biscuits, but no shortening, lard, or butter. I do have margarine and oil. I am pretty sure that you can sub the margarine for butter in any recipe. Hope they come out great! You can sub margarine. It has a higher liquid content, but after your first batch you will be able to judge if the next batch will need a tad more flour. I have always used liquid shortening. Use the same measure as for solid shortening. I had the same question and googled it. One recipe had like 2 to 4 tbs. mayonnaise to about 2 cups self-rising flour and some milk. Another recipe incorporated mashed potatoes--like one cup to two cups flour with baking soda. I am a vegetarian and was thinking of using cashews blended with water to make a thick cream like consistency and using this in place of oil or shortening, but I am hoping the result will not taste - nutty - sort of speak! Good luck on this, as I am trying to resolve the same question here. Does anyone have a recipe for biscuits from scratch. That comes close to what Bisquick makes. The back of the Dixie Lilly self-raising flour package has an excellent recipe. A recipe for homemade bisquick at this link. I have never made bisquick biscuits, but here is my from scratch recipe that we use all the time. I usually double the recipe because my family loves them. Mix dry ingredients, then measure water or milk in the same container at the same time, then dump into the center of the dry ingredients. Stir just until blended, if they are a bit powdery this is just right. Drop large scoops of dough with a soup spoon onto an ungreased cookie sheet. Bake in a 425 degree oven for 20 minutes. You can pat the biscuits to shape them, but my family likes the crispy edges that come from leaving them untouched-up. The insides are fluffy and light. These are absolutely best straight from the oven, but they keep alright on the pan with a dish towel over them or in a zip lock bag left open to retain some crispness (after they are totally cool). I have also made gravy using 2 cups water, 2 tsp bullion (or whatever is suggested on the package) and 1/2 cup flour. Stir together and heat in a sauce pan until thick and bubbly, season with pepper to taste. Can I mix the ingredients for biscuits and bake them later, just before dinner? In preparation for company and preparing a big meal for dinner, I have made a pan of biscuits and set it the refrigerator until time to cook them. You can also bake your biscuits ahead of time and freeze them. Take them out of freezer and place them on a baking sheet. Put the frozen biscuits into a cold oven. Set temperature at 450 degrees and timer for 10 minutes. They taste just like fresh baked. This is what I do most of the time. Learned this trick from my step-mom. How do you make homemade biscuits from scratch? Go to this site : www.southernplate.com. There is a recipe for "scratch" biscuits. There is also a tutorial (with pictures) for the biscuits. This makes it easy for a first-timer to follow each step. And you'll know how your dough is supposed to look during each step. Lots of luck! Personally, I use White Lily Flour and Crisco shortening. White Lily is made from soft winter wheat. Guess it is a "southern thing". My mama always used White Lily, as do most folks I know. Now you'll need to make some crock-pot apple butter to put on those biscuits. 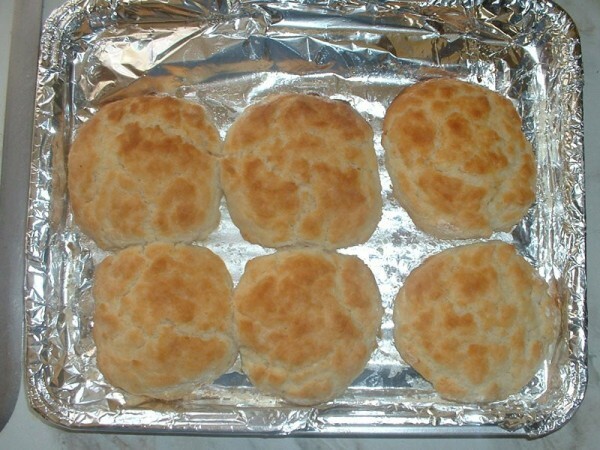 This is a guide about making homemade biscuits. Homemade biscuits are delicious and easy to make. This page contains buttermilk biscuits recipes. These delicious biscuits are great for breakfast or with a main dish for supper.